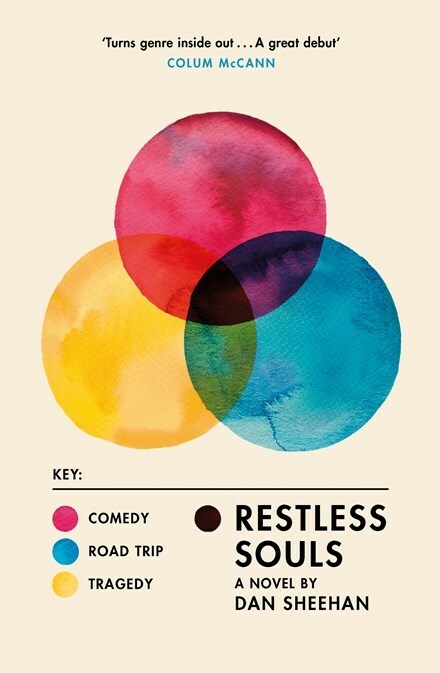 The venn diagram on the cover of Dan Sheehan’s debut novel Restless Souls suggests that it falls in the sweet spot between comedy, road trip and tragedy. The novel definitely has all of these elements, but they are not always as balanced as the cover suggests. And while it might complicate the diagram a little, Sheehan includes a number of other elements including philosophy, family drama, historical drama and war film. All that said, Restless Souls does, for the most part, hit a narrative sweet spot. It is the early 1990s and Tom has returned to Ireland from war-torn Sarajevo shattered by his experiences there during the siege. His old friends Karl and Baz have hatched a plan to help him recover from a debilitating PTSD. They have found a clinic in California which specialises in treating war veterans and they have pooled their dwindling money to take Tom. While they are three, hanging over all of them, particularly foster brother Karl is the suicide of their fourth, Gabriel. Slotted within Karl’s first person narration of the trip are excerpts from Tom’s diary of his time in Sarajevo during the siege. He had no reason for being there except an innate desire to help people in a war zone and the experience scars him deeply. While this all sounds like it is on the tragic side, there is plenty of black, Irish humour, particular in the banter between the three and Karl’s acerbic observations. The middle of the book, their drive from LA to the coastal clinic, called Restless Souls, is classic road trip, with three getting lost in the desert after taking a wrong turn, meeting strangers and having a short adventure. It is at the clinic that things start to slow down a little and Sheehan dips into a lengthy exposition on the science of neuroprogramming. But this is only a short section and serves as a bridge to an emotional finale. Restless Souls is an impressive debut. Sheehan successfully juggles the first person narrative with Tom’s diary entries. The Sarajevo entries, while harrowing, carefully pull away from the worst that Tom experienced, leaving most to the imagination. And while there is ultimately a little too much wish fulfillment, the characters earn whatever rewards they manage to gather along the way.